The world of a scriptable application, as revealed and made accessible to us through Apple events, is a world of objects. We may imagine a scriptable application as dispensing objects to us; just about any Apple event we send to a scriptable application will need to specify such an object. Much of the art of scripting a Mac application with Apple events is knowing what objects the application is willing to dispense, and how to specify a desired object. Even if you don’t particularly need an object as a value, you will still need to know how to refer to an object, in order to make your scriptable application do anything. We have already learned how to refer to one of the scriptable application’s objects — its representation of itself, the :application object, which comes to us as an Appscript::Application instance. (It will become clear later in this chapter why I speak of the :application object using a Ruby symbol, a name starting with a colon.) This object, alone, can be made to do a few things, without reference to any other object; we can tell it, for example, to activate, or to quit. But the really interesting stuff doesn’t start happening until we can refer to other objects that the scriptable application is ready to dispense. Let’s take iTunes as an example. Let’s say my copy of iTunes contains a song called “Broke and Hungry Blues”, and that I’d like to tell iTunes to play it. To do that, I need somehow to refer to the song “Broke and Hungry Blues.” How do I do that? Let’s go further. The song “Broke and Hungry Blues” has an artist. That, too is an object. How can I script iTunes to tell me the artist of the song “Broke and Hungry Blues”? You can see already that anything interesting we want to do with iTunes is going to involve objects beyond the mere :application object. This chapter tells you about the nature of such objects and how to refer to them. When I speak of an “object” in the world of a scriptable application, this hasn’t much to do with the notion of object-oriented programming, as embodied in a language like Ruby (though of course, because Ruby is object-oriented, if we ask a scriptable application to give us one of its objects, it will arrive as a Ruby object). But a scriptable application’s objects do have certain architectural similarities to Ruby objects. One such similarity is that an object in the world of a scriptable application can have attributes, which are somewhat like a Ruby object’s instance variables. Every attribute is either a property or an element. (In a sense, “attribute” is simply a made-up word intended to embrace the notions of property and element together.) What’s more, it turns out that the way we specify an object is in terms of some other object’s attributes — its properties and elements. So we need to know about properties and elements in order to get anything done in the world of a scriptable application. We need to know about them in order to understand the nature of a scriptable application’s objects, and we need to know about them in order to refer to a scriptable application’s objects. That’s why properties and elements are the subject of this chapter. Also, an object in the world of a scriptable application has a “class,” though this is only vaguely similar to the Ruby notion of a class. As we’ll discover in this chapter, a scriptable application object’s “class” is little more than a list of what properties and elements it has. A property is an object attribute that is a single named value. For example, every song in iTunes has an artist, much in the same way as we can imagine creating a Song class in Ruby whose methods refer to an @artist instance variable. Just as we could then get and set a particular Song instance’s @artist value (if the Song class has the appropriate accessors for the @artist instance variable), so too we can get and set a particular song’s artist value in iTunes. So from now on, when I want to speak of a property of an object, I’ll use the name of the method that you would send to that object using rb-appscript to refer to that property. For example, I’ll speak of an artist property (using that typography), or of a song’s artist. We now know how to refer to a property; but how do we obtain that property’s value? The primary way is by sending it the get message. In telling you this, I’m getting a little ahead of myself, because get is a command, and formal discussion of commands doesn’t really start until the next chapter. But get is such a useful thing to say, especially when you’re testing to see whether you’re successfully referring to a property, that we may as well start using it right now. Now we’re cooking with gas! We have actually scripted iTunes to do something useful: we asked it a question and received the answer. So remember the magic word get when you actually want to retrieve and examine a property’s value. I’ll be using it quite a lot throughout the remainder of this chapter. Intuitively we can see that these are very different sorts of thing. The value :paused is simple. The value app("/Applications/iTunes.app").sources.ID(41).user_playlists.ID(399).file_tracks.ID(412) looks more like a Ruby expression; it looks like the kind of thing we would say, in Ruby, to a scriptable application. And in fact that’s exactly what it is. Let’s call values of the first type copies, and values of the second type references. The Ruby class of a copy will vary; it might be String, or Fixnum, or Symbol, or any of a number of various other things. But the Ruby class of a reference will always be Appscript::Reference (except for the :application object, which is an Appscript::Application; but it amounts to the same thing, because Appscript::Application is a subclass of Appscript::Reference). Here’s what’s really going on. We are communicating with a scriptable application. That scriptable application is populated by a world of objects. For example, in the iTunes world, there are playlists and songs. In the Finder world, there are files and folders. When we say get to a scriptable application, the scriptable application cannot actually send back to us any of its own objects. It can’t even send a pointer to any of its own objects. The two worlds — our world, and the world of the scriptable application — are separate and are not synchronized with each other. If a value is “simple”, such as a string or a number, the scriptable application makes a copy of the value and sends us the copy. So, for example, if we ask for the value of the name of the current track in iTunes, iTunes might tell us that it is "Broke and Hungry Blues". This is a string, but it is not the scriptable application’s own string; it’s a copy. If we mutate this string, altering it in place, we will have no effect on the name of the current track in iTunes. The two worlds are separate. We can change the name of the current track in iTunes, but not by mutating this string. (I’ll discuss how to change it in the next chapter.) Mutating the string merely changes our copy of the string. If a value is one of the scriptable application’s “objects,” such as a folder or a playlist, the scriptable application sends us a reference to the object. A reference is a descriptive expression; in particular, it is an expression that we could use to specify that object in talking to the scriptable application. In reality, a reference is an object specifier, just like the object specifiers we examined when looking at raw Apple events in Chapter 3. In that chapter, do you remember how we asked iTunes for its selection, and we got back an Apple event that was a great big object specifier? That’s a reference. Ruby (rb-appscript) packages a reference as an object of class Appscript::Reference. This object can be used directly as an object specifier that we send to the scriptable application. But if we convert the object to a string, as we do with puts, we are shown the Ruby expression that we would use to form this object specifier from scratch. A reference that you form is itself a Ruby object. So you can form a reference now, assign it to a variable, and then use the reference later. You could use it by sending it a message that forms a further reference; or you could use it by sending it a command, such as get, that causes an Apple event to be sent to the scriptable application. It’s important not to confuse those two uses of a reference, because you don’t want to send an Apple event unnecessarily. Again, no Apple event was sent until the last line, when we said get, because that’s a command. That code works — we did learn the name of the current track — but we sent two Apple events where one would have done. This is bad practice if done accidentally. We have seen that, in our Ruby world, a value that we obtain from a scriptable application with get might be something like a String, or a Symbol, or an Appscript::Reference. That is its Ruby class. But in the scriptable application’s world, things have classes too. It can often be useful to know what class the scriptable application thinks a value is. To distinguish between the Ruby notion of class and the scriptable application’s notion, we’ll use the term class_ to refer to the latter. So, the current track in iTunes is at this moment a :file_track object; its class_ is :file_track. Observe that the class_ name is reported to us a symbol. This is why I refer in this chapter to “the :application object”; what I mean is, the scriptable application’s single object whose class_ is reported as :application. Another similarity between a class_ and a Ruby class is that one class_ can inherit from another. For example, the current_track need not be a :file_track; it might be a :URL_track, and there are other possibilities as well. But all such possibilities have certain things in common, and this commonality is expressed by the fact that these classes all inherit from the :track class. The current_track property, if it has a value, will be a :track, meaning a :track or some subclass thereof. The notion of inheritance here is extremely simple-minded; what’s inherited is, in fact, exactly the list of properties. For example, a :file_track has a name property because it inherits this fact from :track. But there is also a difference between a :file_track and a :track (if there weren’t, they would be effectively the same class_). A :file_track has a location property (pointing to the file); a :track doesn’t. A :URL_track, on the other hand, instead of a location property, has an address property (the URL). Figure 5–1 uses these facts to suggest the relationship between class_, properties, and inheritance. Unfortunately, the scriptable application has very limited introspective ability; so, unlike Ruby, you can’t quiz an object in the scriptable application’s world as to its inheritance. You can ask the current_track for its class_ and learn that it is a :file_track, but you cannot then ask it for its superclass and learn that this is :track; you have to know in some other way that :file_track inherits from :track. That other way is, of course, the dictionary. The definition of a class_ whose objects are represented to us as a simple value, such as a string, is basically universal across all scriptable applications. But in the case of a class_ whose objects are represented to us as an Appscript::Reference, every scriptable application is free to define differently what properties objects of that class_ will have (and how that class_ fits into the inheritance structure). For example, :item is a class_ in iTunes, the Finder, and BBEdit, but it’s different in each. This is just one of the many things that makes scripting Mac applications tricky. An element is an object attribute that is an object reference specified in terms of its class_. Think of the object as being endowed with arrays of object references, where all the objects referred to in each array are of the same class_ (or subclasses of the same class_). Then we can use the name of the class_ to refer to such an array; actually, in rb-appscript, we use a method whose name is the plural of the class_. So, for example, the iTunes :application object has :playlist elements. This means we can think of the iTunes :application object as having an array of :playlist object references, and we can refer to this array by sending the iTunes :application object the playlists message. That was a much shorter array, consisting of just one item — a reference to the very same playlist that was the first item of the playlists array. As with properties, so with elements, the way we know what kinds of element an object has is chiefly because we know something about the object’s class_. (And we know it by consulting the dictionary.) But of course we don’t know beforehand exactly what elements of each kind an object has; to find that out, we have to ask the scriptable application. The answer depends on the situation in the scriptable application at the moment. My copy of iTunes has the particular playlists it has because those are playlists I’ve given it; your copy has a different set of playlists (and my copy could have a different set of playlists a few minutes from now, because I can create or delete a playlist). 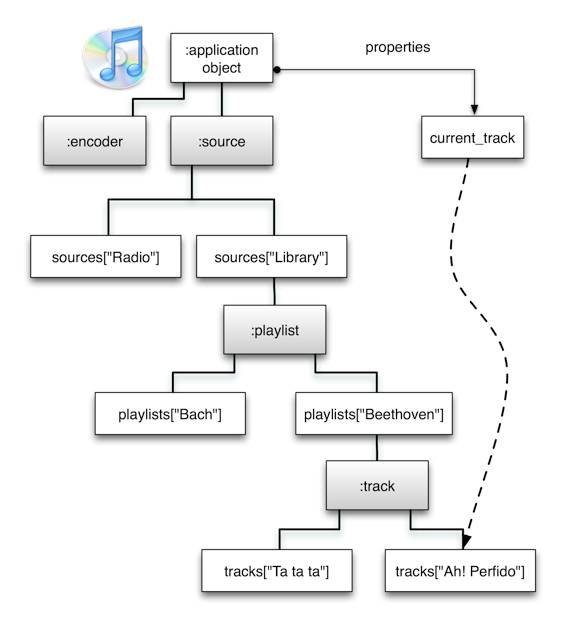 The relationship between an object and its elements is often thought of as “has” or “contains”: iTunes (the application) “has” playlists, a playlist “contains” tracks. But perhaps it would be better expressed as “might have” or “can contain”, since at a given moment an object’s array of elements for a certain class_ might be empty. A playlist might contain no tracks, for example. We’ve just seen that the iTunes :application object has many :playlist elements, and that we can get an array of references to these with the playlists method. But how can we refer to a particular :playlist element? To do so, we need to form an element specifier. There are actually eight different forms of element specifier. Okay, now pretend I’m jumping up and down, waving my arms, and screaming: the  in that example is not the Ruby Array item accessor. The playlists method doesn’t return an array; it returns a reference (an Appscript::Reference). The above example doesn’t fetch the entire array of playlists and then get item 1 of that array; it asks the iTunes :application object for just one playlist, namely, the first playlist in its (internal) array. And that’s a very good thing. It can be time-consuming and foolish to ask a scriptable application for an entire array of references when all you want is one particular reference. Be very, very sure you understand the difference between that example and the previous one. They do very different things, even though the output is the same. The index of an object can change in real time. For example, among windows, windows is usually the frontmost window. If you bring a window to the front (or if the user does), its index may change. Similarly, among the files in a folder in the Finder, index order is alphabetical display order; if you change a file’s name (or if the user does), its index can change. This fact is the basis of many bugs in beginners’ scripts. Unlike Ruby, string comparison in the scriptable application world is generally not case sensitive, so the case of the name string shouldn’t matter. It may be possible to specify an element in terms of its preceding or succeeding something else. The syntax here is to chain to an object reference the next or previous method, which takes the name of a class_ (a symbol) as its parameter. We come at last to one of the most powerful and interesting ways of specifying elements. It may be possible to describe the desired element(s) in terms of a boolean test — that is, those elements of which a certain condition is true. To see why this is powerful, let’s consider such a test. In iTunes there are tracks, and a track can have an artist. Imagine that we want the tracks whose artist is Blind Lemon Jefferson. Now, obviously we could just interrogate all the tracks in succession: “How many tracks are there? 11437? Fine. Tell me the artist of track 1. (We look to see if it’s Blind Lemon Jefferson.) Now tell me the artist of track 2. (We look to see if it’s Blind Lemon Jefferson.) Now tell me the artist of track 3…” This is tremendously inefficient on a number of grounds, not least the huge number of Apple events being sent. With a boolean test specifier, we send just one Apple event describing the test, and iTunes performs that test, internally, picking out just the requested elements for us. Clearly the power of this approach has its limits. The target application must implement the test we request, and the test must be within the power of Apple events to express. It is not hard to bang up against these limits. For example, if our test would involve matching a string against a regular expression, we’re out of luck, because Apple events (and most scriptable applications) know nothing of regular expressions; so in that case, we really might need another approach (and I’ll show such an approach in examples later in this book). But Apple events can express a surprisingly wide range of conditions, and a boolean test specifier can be an elegant time-saver. A boolean test is performed either against each element as a whole or against a property of each element. (For example, we want the tracks whose artist property is Blind Lemon Jefferson.) Either way, the condition must start with a reference that stands in for the notion “each element”. That reference is the Appscript.its method. The condition will thus start with Appscript.its or Appscript.its.property_name. Let’s demonstrate by performing our test for tracks whose artist is Blind Lemon Jefferson. The tracks must be specified as elements of some playlist; I’ll use the Library playlist, thus effectively testing against all tracks. The result is an array of references to five tracks. blj = "Blind Lemon Jefferson"
The result is an array of references to three tracks (Blind Lemon Jefferson did have a propensity for songs with “Blues” in their title). As with name specifiers, so too string comparisons in a boolean test are generally not case-sensitive. Scriptable applications will often allow an operation to be distributed over multiple references that have been gathered internally. A typical such operation is referring to a property. So, suppose you use an element specifier that can result in multiple references. And suppose what you really want to talk about is not those references, but some property of each of those references. In many cases, you can simply send the method naming that property directly to the element specifier. Now I have an array of the names of all the playlists. If those names are unique, I can use them later to do something with each playlist, using each name to form a playlists element specifier. The result is an array of arrays, each inner array consisting of references to each of the tracks of one playlist. That’s a tremendous amount of organized information resulting from a single Apple event. The possibilities boggle the mind. We have now basically discussed all the ways of referring to an object that a scriptable application is willing to dispense. Furthermore, we’ve seen that all references begin ultimately with the :application object (represented by an Appscript::Application instance). So if there’s an object in a scriptable application’s world, and if the scriptable application wants to make this object available to scripters, the scriptable application had better make it possible to reach this object via a chain of references starting at the :application object. Since elements describe a potential one-to-many containership relationship, we can loosely imagine successive containers and their elements as arranged in a tree structure. The chain of references reaches a desired object by traversing this tree. This tree arrangement of the application’s objects is called its object model. Figure 5–2 shows a tiny part of the object model for one user’s copy of iTunes. The diagram shows elements as class_ names followed by specifiers for some particular elements. In real life, each iTunes class_ has many more elements, and the tree is much more elaborate. In Figure 5–2, one :application property, current_track, is shown in order to point out that although the object model is primarily about elements, a property can provide an alternate way of accessing an object. In iTunes, another example is that the :application object has :browser_window elements, representing the primary player window; a browers window’s view property is the playlist currently displayed in the window, so this is a completely different way to access a playlist. Also, some objects can be referred to only by way of a property; for example, the Finder :application object has a Finder_preferences property whose value is the application’s single :preferences object; no object in the Finder’s object model has :preferences as an element. Different elements, too, can provide alternate paths through the tree to refer to an object. We’ve already seen, for example, that a :playlist has :file_track elements, :file_track being a subclass of :track; in Figure 5–2, both Beethoven tracks are in fact :file_tracks, so we could have used playlists["Beethoven"].file_tracks to refer to them. If you look in the iTunes dictionary, the :application object has no :playlist elements. Yet we can successfully say itu.playlists, with no intermediate sources element. The reason is that iTunes permits us to use a shortcut; when we say itu.playlists, iTunes assumes that we mean itu.sources["library"].playlists. This makes perfect sense, because the other :source element, itu.sources["radio"], has no playlists! So this is a reasonable convenience for iTunes to offer us. The fact that it is undocumented in the dictionary, however, is annoying; the shortcut can be discovered only by experimentation. The :application object in the Finder dictionary does have :file elements, but it remains an undocumented mystery what this could possibly mean; files can only live in a folder, or at the top level of a volume (a disk). Yet we can say f.files anyway, and when we do, we discover that the Finder assumes we mean “on the desktop” (expressed here through the :application object’s desktop property). Again, this is a lovely convenience, but some documentation would have been nice. You can expect to encounter similar shortcuts across the object model in many other scriptable applications as you experiment. In a sense, then, TextEdit is shortcutting from a stretch of text to the text itself. Now the Finder starts all the way at the top of the folder hierarchy, with the startup_disk property, and works its way down the folder hierarchy with name specifiers to reach the object in question. There’s no particular lesson here (and, as we’ve just seen, no particular consistency). When we get an object reference from a scriptable application, it can couch that reference in any form it likes. It certainly need not be the same as the form we supplied to start with, so we shouldn’t be surprised. What we can assume is that what the scriptable application gives us is a canonical reference, that is, a reference that we could reliably use to specify the same object. In iTunes, for example, two tracks in a playlist might have the same title, which is the track’s name property; so iTunes uses an ID specifier instead. In the Finder, however, two items in the same folder cannot have the same name, so the Finder uses name specifiers. To a Ruby programmer, exceptions are exceptional. But in the world of scriptable applications, it is quite common to see an exception raised over the most trivial offense. Such an exception, like any Ruby exception, must be handled if it is not to percolate up to top level and cause your program to terminate. 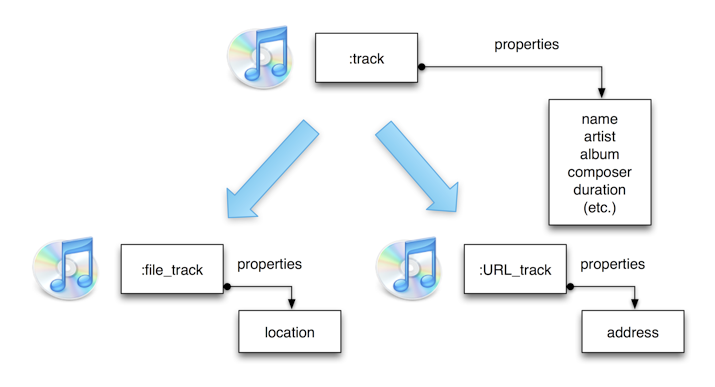 A good example is the iTunes :application object’s current_track property. If you ask for this property’s value and there is no current track, iTunes responds with an exception. #=> Appscript::CommandError: CommandError OSERROR: -1731 MESSAGE: Unknown object type. #=> Appscript::CommandError: CommandError OSERROR: -1728 MESSAGE: Can't get reference. I display two different possible error messages, because different versions of iTunes raise different exceptions under these circumstances. But the important thing is that these are valid error messages, being passed on to you by rb-appscript from iTunes itself (the Appscript::CommandError class designation tells you so), and that iTunes evidently regards raising an exception as a perfectly reasonable way of saying “There is no current track”. A Rubyist would expect a nil result; the world of scripting applications does have something parallel, :null, but I have never once seen it used in all my years of scripting. Another alternative is :missing_value, and mercifully, scriptable applications are increasingly using this; but exceptions remain common. The takeaway message is that you must be prepared for exceptions. In iTunes, the mere query as to whether there is a current track in iTunes can cause an exception. So your program must be constructed accordingly; don’t even mention the current track without supplying exception-handling. Here’s a sound bit of programming for reporting the name of the current track. puts "There is no current track." The third line contains a necessary trick. As the comment points out, we must form our second, partial reference in the same way as we would form any Appscript::Reference: we must start with an Appscript::Reference or Appscript::Application instance and send method calls to it. Therefore we start with our reference to the Finder, where rb-appscript will permit us to use legal Finder terms like files. The append method strips out that Finder reference (that’s what result[1..-1] does) before appending the second reference to the first. What’s happening here is that, behind the scenes, instead of sending back to Expression Media the very same object reference that it sent us, rb-appscript is deconstructing the object reference and reconstructing it in a valid form. This takes a little longer but it fixes the problem.